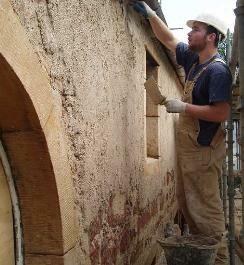 Sean Osmond applying Lime Mortar - Image courtesy of Caroline Vawdrey. LTM recently ran a series of training days in conjunction with the Scottish Redundant Churches Trust (SCRT), for professionals and homeowners. The courses, on the use of lime mortars for traditional masonry repair, proved very popular and were fully booked well in advance. The training courses were run in parallel with the £1m restoration of Cromarty East Church, where LTM are currently working as main contractor. The courses were delivered by Craig Frew, LTM’s Technical Consultant and Andrew Newcombe, LTM’s Project Leader for the Cromarty East Church project, and all delegates proved keen to get stuck into some hands-on work to the stone boundary walls. “It is never knowing what type of building and new challenges we’re going to meet next that keeps the work exciting.” Andrew Newcombe, LTM Project Leader. “We’re extremely fortunate to have Laing Traditional Masonry Ltd as the main contractors. They have a superb reputation, not only for the quality of their work, but also for their commitment to training apprentices - the next generation of skilled stonemasons and craftworkers.” Victoria Collison-Owen, SRCT Director (Quote from Cromarty East Church website).